obligated to raise interest rates and slam on the brakes before inflation got out of hand. This also killed growth and caused recessions, but he figured it was the only choice he had. Central banks would prefer an effective system of regulation, but due to capture of legislatures by the banking sector they are unlikely to get it. Thus they are going to be driven to be always wondering whether they should be putting extra downward pressure on asset prices — with implications for employment and possibly growth. The fact that “Punchbowlism” can be implemented by central banks by themselves makes it the default option. “Central banks would prefer an effective system of regulation”? You could have fooled me. It strikes me that the Fed has been captured by the banking sector every bit as thoroughly as Congress has. The Fed, after all, still has considerable influence. If Ben Bernanke pulled out his shiniest, sharpest pitchfork and took to the podium with a really full-throated, sky-is-falling warning that we needed serious new financial regulations and then demanded that CONGRESS. MUST. ACT. NOW — well, Congress would probably act. Not completely. It’s still Congress, after all. 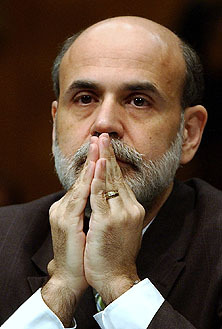 But if Bernanke really put his back into it, he’d make some pretty serious waves. But I have not, to put things delicately, noticed him doing any such thing. On the contrary, he seems far more interested in protecting the Fed’s turf, offering up weak-tea compensation proposals, slow rolling increased consumer protections, and pretending that a brand new committee devoted to “systemic risk” will somehow do what the Fed has never done before. These are not the actions of a revolutionary who wants to remake the regulatory system. I’m a Bernanke skeptic, so I guess my crankiness here can be discounted. But I simply haven’t seen any sign that he’s really dedicated to root-and-branch regulatory reform. I also rather doubt that he’s very dedicated to “punchbowlism,” frankly. In fact, as near as I can tell, he’s basically dedicated to getting us out of our current crisis (which is good!) and then tweaking the system just enough so that things can go back to the way they’ve always been (not so good). I hope he proves me wrong.